Last Updated: Jan 22, 2019 @ 11:12 am. After comparing 15 different crib mattress brands, we pick the Moonlight Slumber’s Little Dreamer foam crib mattress ( $196.90) as the Best Baby Crib Mattress 2019. Scroll down for our picks for Best Budget-Friendly Crib Mattress, and Best Eco Baby Crib Mattress. New to crib shopping? Read our 7 Things No One Tells You About Buying a Baby Crib Mattress for advice and tips. Looking for reviews of individual crib mattress brands. Click here! The mattress comes with square corners for a tight fit, an internal fire barrier (no toxic chemicals) and medical-grade foam partially made from soybeans (making it just 7 to 10 lbs.). The mattress is easy to clean and made in the US. The company also touts its mattresses as hypoallergenic. Priced at $196.90, we thought this one was a good buy as competitors are creeping closer to $300 and even $400. Got an unusual size crib? Moonlight Slumber offers custom sizes of their mattresses. That’s unusual as most makers sell one standard size. Overall reader reviews of Moonlight Slumber are quite positive. Parents note that the mattress doesn’t sag even after months and years of use. (2018 update: our top pick here used to be the Naturepedic’s No Compromise Organic Cotton Classic Lightweight, which now we moved to our Also Great pick—see below. Why the switch? Well, we heard you, readers. In the past few months, our parent feedback has favored this Moonlight Slumber mattress over Naturepedic. That doesn’t mean the Naturepedic is a bad pick, just that it has fallen behind this new top pick among our parent readers). This mattress is tops in reader feedback, based on quality, durability and overall satisfaction. An excellent woven cover with sealed edges is the star here. This mattress ticks all the boxes for a great crib mattress that is also eco-friendly: light weight, no chemicals, waterproof cover, organic fabrics. The Naturepedic No Compromise Organic Cotton Classic Lightweight Crib Mattress is also a great pick for crib mattress, especially for those who prefer a more eco-friendly option. Naturepedic’s No Compromise Organic Cotton Classic Lightweight mattress features closed-cell air pockets made from food-grade polyethylene. As a result, this mattress is half the weight of a traditional coil mattress. The basic model runs $289.00; a dual-firmness model is $289.00—the harder side for infants, the softer side for toddlers. If you want a coil mattress, Naturepedic’s Organic Cotton Classic 150 coil mattress is a good bet at . In a nutshell, Naturepedic balances the best of both worlds: organic cotton filling, a firm foam or coil innerspring AND a waterproof cover. All of Naturepedic’s mattresses contain no PVC’s, polyurethane foam or chemical fire retardants. Naturepedic’s owner Barry Cik got the idea for his company after a frustrating search for a crib mattress for his grandchild. Cik, an environmental engineer and hazardous material expert, was appalled at what he found on the market—crib mattresses made of petro-chemical foam, chemical fire retardants and more. “I knew all about vinyl/PVC, polyurethane foam, and the various chemicals contained in them and there was no way I was going to put my grandchild to sleep within a few inches of these chemicals” Cik said. In 2004, Cik launched Naturepedic as a more natural alternative. The company has five goals for its crib mattresses: no harmful chemicals; no allergenic materials; natural, organic and renewable materials wherever possible; practical, easy to clean design; and third-party testing by GreenGuard to ensure they meet strict standards. Naturepedic offers four series of crib mattresses: lightweight, classic, ultra and quilted/2-in-1. Prices range from $260 to $289. As a result, this mattress is half the weight of a traditional coil mattress. The cover is organic cotton fabric with a food grade polyethylene waterproofing—making it both waterproof and dust mite/bed bug proof. Under the cover is another layer of organic cotton filling and there are no chemicals required to make it flame retardant. Another plus, the mattress is seamless with waterproof edges. The No Compromise is GREENGUARD certified and the components are certified organic as well. While Naturepedic’s price may seem high compared to other crib mattresses, they are substantially less than the competition in the organic mattress category where prices can top $400. If you want a traditional coil mattress, Naturepedic’s Organic Cotton Classic 150 coil mattress is our pick. It’s made with organic cotton filling, a firm coil innerspring and the waterproof cover mentioned above. The No Compromise is not exactly the cheapest mattress on the market, but it is comparable (and somewhat less expensive than) other organic, chemical-free options. In online reviews, some parents have complained their mattress sagged after only a short time. Other parents note that the measurement of the mattress was off and it was too small for their crib (leaving an unacceptable gap). Naturepedic replaced those mattresses that had problems. Overall, the company’s customer service is good. Nothing fancy here—just a good basic crib mattress at an affordable price. Caveat: the single-layer vinyl cover will only last for one child. Best Budget-Friendly Crib Mattress. Yes, you can buy a safe foam mattress for as little as $49.96. The Safety 1st Heavenly Dreams White Crib Mattress is our top pick for budget-friendly crib mattress. Sure, it’s no frills—a basic foam mattress with a single-layer vinyl cover that is easy to clean. Quality is good, but the single-layer vinyl cover will probably only last for one kid.No fancy eco materials or seamless edges, but an excellent deal is the budget is tight. The Sealy Soybean Foam-Core crib mattress ( $155.71) is a great runner up to the Safety 1st mattress. It is GREENGUARD certified to be low emission and, yes, the foam is partially made from soybeans. At just 8.3 pounds, this lightweight but firm mattress makes changing sheets easy. At $155.71, you can get the eco-friendly features without shelling out over $300. Lullaby Earth’s non-toxic, food grade foam mattress is lightweight and affordable. Best Eco Baby Crib Mattress. Lullaby Earth’s Healthy Support crib mattress is made of polyethylene foam (a non-toxic, food-grade foam that requires no fire retardant chemicals) and weighs just 7 lbs. (Most other foam mattresses on the market are made of polyurethane). It features seamless edges and GREENGUARD-certification. Price: $169.00. A 2-Stage version of this crib mattress is $200 at Walmart. The Healthy Support is an excellent, lightweight option at an affordable price. The Naturalmat Coco Mat crib mattress uses coir (from coconuts) for the majority of it’s filling. Yes, it’s an expensive option, but checks all the boxes for both an eco-friendly and sustainable crib mattress. Also Great: Naturalmat Coco Mat. UK-based Naturalmat offers three organic mattresses made of coir (the husk of a coconut), latex or mohair. Our favorite is the Coco Mat. The filling is made from coconut husk wrapped in organic lamb’s wool and then an organic cotton cover. While the Coco Mat generally gets good reviews, it does have a significant disadvantage over other mattresses: there is no waterproof cover. That means you’ll have the extra expense of purchasing a mattress protector (Naturally, Naturalmat sells one made of organic cotton for about 50 bucks). And at $424.00, you’re already shelling out a significant amount of cash for all this eco-goodness. On the other hand, if you want to splurge, at least you know this is a high quality product. Lightweight but firm, the Dream on Me 3″ Portable Crib Mattress is easy to change in the middle of the night plus it’s waterproof with an antimicrobial cover. We like the Dream on Me 3″ Mini/Portable Crib Mattress ( $26.99). as the Best Mini Crib Mattress. Yes, it is firm and light! Weighing under 2 lbs., it makes for easier sheet changes in the middle of the night. Yes, it also has a waterproof vinyl antimicrobial cover. Reader feedback on this mattress has been very positive, with folks saying it does the job at a reasonable price. One point that can be confusing here: even though they have the same interior dimensions, mini cribs are different than portable play yards that have soft sides. Above, we urge parents NOT to buy a separate mattress for portable play yards (sometimes called travel cribs or portable cribs). Why? That’s because those products come with their own mattresses or pads—the CPSC says to only use the mattress pad provided by the manufacturer (most, if not all, come with a mattress). Do not add an additional pad or mattress on top of the original mattress. Mini cribs, however, are sometimes sold WITHOUT a mattress. In that case, we’d go for the Dream on Me pick in this section. One final caveat: some mini cribs have limitations on how THICK a mattress can be. The mattress here is 3″. Be sure to read any manufacturer limitations or safety guidelines on mini cribs. For more information about which mini cribs we recommend, read here. All you need: a pad that washes well and stops leaks plus it doesn’t make noise. GreenGuard certified. Best Waterproof Pad. In this category, we’re referring exclusively to a crib mattress-size waterproof pad or mattress protector. We are not referring to travel mattresses or port-a-cribs. Our top pick for waterproof crib mattress pads is the SureGuard Mattress Protector for cribs ( $25.97). It comes with a 100% cotton top surface while the waterproofing material is polyurethane. It is Greenguard Gold Certified for low VOCs and doesn’t contain any phthalates, PVC or BPA. Caveat: readers note you have to strictly follow the washing instructions (delicate cycle) or risk losing the waterproofing. Also SureGuard makes waterproof pads for adult size mattresses as well. Reviews of the crib mattress protector may be mixed with reviews of other sizes. We think the crib size works very well unless you have a high volume child. The Carter’s Keep-Me-Dry pad is an affordable waterproof pad that features a soft, quilted polyester top and waterproof vinyl backing. We like the all-around elastic and reinforced corners. The pad is machine washable. The contoured sides on the Summer Infant Contoured changing pad plus the no-skid bottom and washable surface makes for a great changing table pad. It’s also very affordably priced. Best Changing Table Pad. Changing table pads help turn a dresser or any surface into a changing table. A couple of shopping tips: look for a pad with elevated sides (see photo). This will help keep your baby on the mattress pad. A word of caution: elevated sides don’t guarantee your baby won’t still roll off the pad, so never walk away when changing your baby. The best pick: Summer Infant’s Contoured Changing Pad ( $19.88); available at Amazon.com and Walmart. If you’re looking for an organic or natural changing pad, consider Naturepedic’s Organic Cotton Contoured Changing Table Pad for about a hundred bucks. Last but not least, we’d like to put in a word for a couple of new types of changing pads: the Keekaroo Soft & Cushy Diaper Changing Peanut Changer ( $129.95) and the Skip Hop Nursery Style Wipe-Clean Changing Pad. While most people are used to the quilted style like our top pick above, these new pads have some distinct advantages over traditional changing pads. First and most important, they’re impermeable to liquids. No worries about liquids seeping into the pad through the stitching on the cover! And they’re made of a slip resistant material that you merely wipe off. In fact, Keekaroo claims their material, a polyurethane polymer “was designed and tested for hospital use.” The Skip Hop is made of PVC-free and phthalate-free foam. Finally, they are both soft and cushy and come with straps to secure baby. The Skip Hop has a toy bar too. We do have one major issue with these kinds of changing pads: price. The Keekaroo is the most expensive at $129.95 (some colors cost more: the raspberry color pictured below, for example). The Skip Hop is a better deal at $74.99. But it’s hard to justify those prices when compared to our traditional changing pad above priced around 20 bucks. While most people do buy a changing pad cover for traditional changing pads this only adds about $13.99 each to the price; still much less than a Keekaroo or Skip Hop. Hopefully, with more competition, prices will come down on these new foam pads. Easy cleaning is definitely a plus here. The Skip Hop Nursery Style Wipe-Clean Changing Pad runs $74.99 and includes the toy bar. Which is probably unnecessary, in our opinion! We’ve been rating and reviewing cribs and crib mattresses since 1994. Yes, that long! In addition to hands on inspections of crib mattresses, we have also visited manufacturer facilities and met with safety regulators—and when we travel, we pay our all of our own expenses. We also evaluate consumer reviews posted on sites like Amazon, as well as our own message boards. We take a hands-on approach to evaulating crib mattresses—that means checking density of samples for firmness and researching the various exotic materials some mattress makers use (are coconut husks safe for a baby to sleep on?). We also gather significant feedback from our readers (parents like you who’ve read our book, Baby Bargains has over 1 million copies in print). We track mattress quality and durability—does that mattress start to sag over just a few months of use? Besides interviewing parents, we also regularly talk with retailers of crib mattresses to see which brands are most trustworthy and other key quality metrics. We meet with key company executives from the major crib mattress makers at least once a year, to stay up on the latest trends and research. Since we’ve been doing this since 1994, we have developed detailed profiles of major crib mattress brands that help guide our recommendations. See below for links. 7 Things No One Tells You About Buying A Crib Mattress! 1. Forget all the fancy claims: all you need is a firm mattress with a waterproof cover. What’s inside the mattress (foam, coil, latex, mohair, etc) is a matter of personal preference. After reviewing dozens of studies on crib mattress safety, there is no evidence that one material is healthier (or more dangerous) than another . . . despite what you might read online! A simple crib mattress starts around $50. 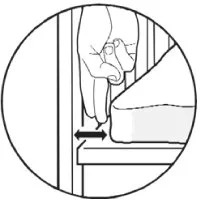 It should snuggly fit your crib with no gaps more than two fingers length between the mattress and the crib (see graphic below). And while you’d think it would be no-brainer, there are some mattresses sold with NON-waterproof covers, so buyer beware. 2. That crib mattress could cost more than your crib. Especially if you opt for a eco-friendly mattress or another specialty mattress. Many of these mattresses top $300 and even $400. Many parents are understandably concerned about SIDS (Sudden Infant Death Syndrome). Unfortunately, some crib mattress makers play on this fear by claiming their super-duper mattress made from special material (unicorn husk shavings?) is “breathable” and a lower suffocation risk than non-unicorn mattresses. Quick fact check: that’s FALSE. These magical claims may lead some parents to think it is ok to put baby to sleep on their stomach. Wrong—the safest way for baby to sleep in a crib is on their back . . . on a firm mattress. (We have a full discussion of SIDS, see our other book Baby 411, co-authored by a pediatrician who is a spokesperson for the American Academy of Pediatrics). 4. Key quality feature to look for: triple laminated/reinforced vinyl covers. These covers are more durable and less likely to tear (when you move the mattress around to change the sheets). Lower quality mattresses just have a single or double layer of vinyl. 5. Say no to that hand-me-down. Your friend’s cousin has a crib mattress sitting in her attic that she’d love to pawn off . . . uh, we mean graciously give you. Politely refuse. Why? Bacteria and mold can grow in an old mattress, even if it has a waterproof cover—and especially if it has been stored in a dank basement or unventilated attic. We also suggest a new mattress with each baby. Babies do all sorts of things in cribs other than occasionally sleep. When it is time to change the sheets, you have to wrestle with that crib mattress. And here, lighter mattresses (usually foam) are much easier to handle than heavier options (most likely coil mattresses). Another option: go for quick change sheets that don’t require you to wrestle with the mattress. Compare the foam mattress (much lighter) to the spring version. If you have to change sheets a lot (common occurrence! ), the springs make this version a lot heavier. 7. Conventional crib mattresses are NOT dangerous. “Common materials in crib, bassinet, cradle and porta-crib mattresses may be harmful and even potentially life threatening to your baby. The majority of mattress manufacturers use toxic, unsafe materials.” —web site of an expensive eco-baby crib mattress. So let’s state it for the record: there is NO scientific evidence that sleeping on a conventional crib mattresses is harmful to your baby. What about mattress materials giving off chemical odors? Yes, crib mattresses are made of chemicals and some do off-gas when first removed from packaging. We do recognize concerns about bad indoor air quality, especially with newly built homes that are tightly sealed. If this fit your situation, look for crib mattresses that are GREENGUARD certified—this is an independent third-party test standard for mattresses that are low in VOC’s (volatile organic compounds). Since babies sleep 12+ hours a day on their crib mattress, we can understand the concern that baby has a safe sleep space. But crib mattress marketers that play on these fears to sell $400 eco options often peddle junk science—these folks claim “polyurethane foam” and “waterproof covers made of polyvinyl chloride or PVC” are dangerous, cause cancer, etc. Usually, these conspiracy theories trace back to a widely discredited campaign by the late New Zealand forensic scientist Dr. James Sprott. He claimed toxic gases from waterproof (PVC) covers and other chemicals in mattresses caused SIDS. If you wrapped a crib mattress in a special plastic wrap, SIDS could be eliminated, Sprott claimed. And of course, several companies spring up to sell such wraps online. (Sprott, who died in 2014, was apparently a controversial character in New Zealand. At one point, after analyzing blood alcohol tests, Sprott said alcohol was not at fault in auto accidents. Instead, Sprott blamed rugby and “aggressive” males. Later, he tried to torpedo a “Red Nose” day charity event in New Zealand sponsored by a SIDS prevent group who had questioned his research). But that hasn’t stopped the fever swamps of the internet in keeping this false theory alive. Dozens of sites selling crib mattresses still quote this discredited theory. Professor Barry Taylor, of the pediatrics department at Otago University, said SIDS researchers did not wish to comment on Dr Sprott’s passing in 2014, but they viewed his legacy with regret, noting the large amounts of time and money that were spent investigating his theory. I love you guys, and have used your recommendations almost exclusively while preparing for our first baby. The Amazon link provided takes you to the page for the classic 150 (coil) mattress. We used the link and did not realize it was not the classic lightweight without coils that was recommended until we unpacked the box today. We have to return the mattress and reorder the lightweight which is only costing us a dollar but a massive inconvenience and postponing our nursery set up. Hi Claire: Could you tell us which link takes you to the coil mattress? We will correct this ASAP. Have you tested the Munchkin Secure Grip Waterproof Diaper Changing Pad, 16″ x 31″ ? Summer still win? Thank you! Yes, we did test one as well and thought it was excellent! Either that one or Summer would do! thank you for all the reviews. They have been helping me a lot. Hello, you dismiss studies done on mattresses but this 2014 study (which is much more recent than the 1998 report) shows that some mattresses indeed off-gas volatile organic compounds which babies should rather not be exposed to -news.utexas.edu/2014/04/02/crib-mattresses-emit-chemicals. Hi Sol: Thanks for writing in! Yes, we did see that study among many others we reviewed. I think the key quote from that article is this: “Chemist and indoor air quality expert Charles J. Weschler, adjunct professor in environmental and occupational medicine at Rutgers University, said he does not think the levels of chemical concentration found in the mattresses are alarming, but he considers the research valuable.” Based on our review of the available evidence, we stand by our conclusion that “there is no evidence that one material is healthier (or more dangerous) than another.” We always are looking at new research on this topic, so we reserve the right to change our mind based on new evidence! Hope that helps! I purchased the American Baby mattress cover based on your review. It is quilted on top and fairly soft. Is this softness safe for baby? I know firm is key for mattresses themselves. Thanks! Hi Julia: Thanks for touching base—yes, we believe that mattress pad is safe when tightly fitted to the mattress, every care taker follows back to sleep recommendations, etc. If for some reason you can’t get a tight fit, don’t use it. Mattresses can vary slightly in dimensions. If you believe there is a concern, you could wait to using this until after baby is one year of age, as that is when the SIDS risk is greatly reduced. Does that help? Thanks! Have you ever reviewed or heard anything about the Milliard crib mattress? Or any thoughts on the fact that it says it’s a dual comfort (flipable) mattress that is firm for baby and softer for toddler. Would love to hear what you think? Hi Rebecca: Not yet—we will put in our to-do list! Meanwhile, if you purchase one, please let us know what you think by posting a review here or email us! Thanks in advance! Are you aware the company that makes your highest recommended mattress has had to settle charges from the FTC that they misrepresent the materials they use in making their mattress? Yes, we were in fact the folks who uncovered that issue and discussed it in our book in 2015. We also blogged about the FTC issue here: https://www.facebook.com/babybargains/posts/about-time-the-ftc-has-launched-a-crackdown-on-bogus-organic-claims-in-baby-prod/1470661723012650/ Moonlight Slumber apologized for their actions and removed the management personnel who were responsible. Hi there! Have you guys tested the crib mattresses from Bundle of Dreams? We have used Moonlight Slumber for the past 5 years but were looking to purchase another for a new babe on the way. Would love to know how it stacks up! Hi Katie: Thanks for writing in! We haven’t researched Bundle of Dreams—we will put them on our list. They seem to be sold only in NYC area stores (besides online, of course)! If you get one, please let us know what you think. We’re planning to buy the recommended Naturepedic mattress. However, I am wondering if we also need a waterproof pad in addition? I know the mattress has a waterproof cover, but I’m unsure if we need both. Thanks! A waterproof pad is optional—some babies leak more from diapers than others. If you have a leaker, consider getting 2 waterproof pads. One for the crib and a spare one if the first is in the wash!